Gas and indigestion are not a disease; it's like a health disorders are occurs due to improper functioning of metabolism and digestive system. Generally we don't care about it or even ignore it. My point is that, you should be care about it; If you are upsetting by gas problems from a long time then you must need to a proper diagnosis. This could turn into a serious stomach or digestive disease. The gas problems and indigestion disorder causes by improper eating, excessive consumption of alcohol and eating gas producing foods (fast foods). Excessive eating of spicy, fried and fast foods or junk foods. Dehydration or lack of water intake. Continuously longer sitting on a place. And it's common symptoms can be bloating or abdominal bloating , belching, burning sensation, stomach pain and nausea. Now get ready to treat these digestive problem with some effective home remedies. 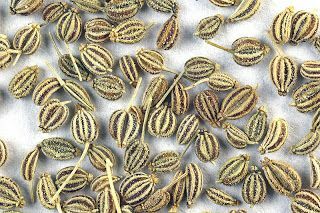 Carom seeds is also known as Ajwain; and Trachyspermum ammi the scientific name of ajwain. Parsley is an excellent herb that works to stimulate the metabolism activity; it is also useful to treat indigestion and stomach pain. Mix 2 grams of carom seeds powder and a pinch of black salt into 125 grams (or a glass) of buttermilk (residue). Mix well and drink it just after the eating food. You would get quick relief from gastric trouble. Take this remedy on a regular basis for about a week. Precaution: - Don't eat rice, Arabic veggies, flowering cabbage and other things during treatment. Garlic is a wonderful kitchen ingredient that works as a gas relieving agent. Naturally garlic has the anti inflammatory and antibacterial properties that helps to treat with digestive problems. If you are embarrassed with gas problems then you have to try raw garlic juice or even raw garlic. Take 2-3 fresh garlic cloves and encapsulates them with seedless raisins; then eat or chewing one by one. you will get a instant relief from indigestion, gas, flatulence and other digestive problems. You can also make a paste of garlic as adding and grinding with water, black pepper and cumin seeds and bring to boil for a few of minutes. Strain it and leave it for become lukewarm. Drink this garlic juice at least twice daily for effective results. Fennel are the best remedy to treat with flatulence, gas and boating. Mix some fresh fennel seeds into a glass of water and bring to a boil for at least 5 minutes on low temperature. Strain this water and drink when it become lukewarm. Alternatively you can use half teaspoon of fennel seeds powder twice a day along with water. This is also beneficial to get relief in gastric problems. Asafetida is also known as Hing or king of the spice; is an powerful a digestion aid that stimulates the metabolism and digestive activities and offers great relief from gas and flatulence. It has anti-flatulent and antimicrobial properties that helps to reducing flatulence. Mix a pinch of asafetida to a glass of warm water; mix well and drink it. You should use this remedy thrice a day to get rid from digestive disorders. Lemon is the great healthy fruit or herb; it has been used by Ayurveda from ancient times for healthy living. Lemon is the rich source of Vitamin C; it has antibacterial, antiviral, antiseptic and antioxidant properties that helps to stimulates metabolism and digestion by produces bile juice to the body. Drink fresh lemon juice daily morning will beneficial to treat with all digestive disorders and also make a healthy and fit body by using this remedy. You should avoid gas forming foods and drink more water to stay hydrate. These remedies will beneficial to treating with all the gastric problems.